A few months ago my sister posted a quotation from Madeleine L’Engle on Facebook: “When you put something into words, it leads to so many other thoughts." 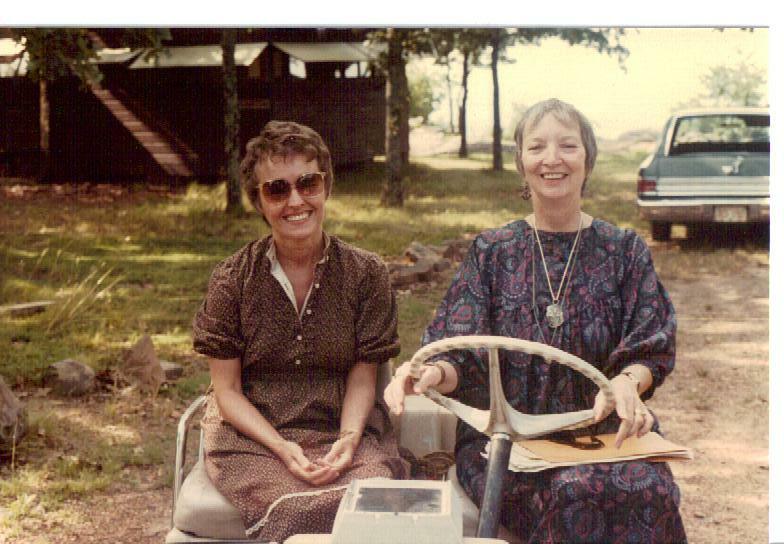 Several people were surprised to learn that we knew Madeleine L’Engle, which led me to think about my own memories of how that happened. I read A Wrinkle in Time for the first time in fourth grade, I think, then went on to all her other children's books. At the same time I was reading Wrinkle for the first time, my mother, a writer herself, was reading L’Engle’s books for adults, and in one of those books L'Engle said she looked like a giraffe, and so we all got the idea to send her a giraffe for her birthday every year, which we did for years. I remember a wooden one from Africa, in particular, that we bought at Pier One. She wrote thank-you notes to us, and we wrote to her, and since both she and my mother were active Episcopalians, Mom eventually invited her to come to a women's retreat at the Arkansas Episcopal church camp, Camp Mitchell, in 1982. (The photo is of them at camp. As it happened, I was busy in college and did not meet her—which of course I now regret. My sister remembers having lunch with her at our house, remembers that she was a “strong but understated” presence and that she laughed easily.) The funniest part of all this is that it seemed wonderful but not abnormal to me as a child. I ran across the book while dusting a high shelf last year and decided to reread it, with trepidation, because I had such happy memories of reading and rereading and was afraid it might seem thin. But I fell right back into the power of the story, worrying when Charles Wallace was taken over by IT and then cheering Meg on as she fought to save him. I also found that, though I still identified with Meg, I had a new identification with her parents and their struggles, and a new appreciation for L’Engle, in 1962 creating a scientist-mother, a woman who held the family together while her husband was mysteriously away. I still attribute my love of old ladies, at least in part, to those three extraordinary women, Mrs. Who, Mrs. Whatsit, and Mrs. Which, funny and disorganized and oddly dressed but also wise and powerful. I had to think about that. And then I realized that my favorite books, my best reading experiences in fiction and, more rarely, nonfiction, have, yes, fucked me up. The novels I’ve entered the most thoroughly have taken me to places, worlds, eras that I can never experience in “real life.” I’m richer for them, and I think that the best writing really does return us to the world in such a way as to help us to live our own lives more deeply and fully, but those other worlds can be so compelling that our own lives may, for a time, seem pale in comparison. The battles we fight may seem minor compared to battling evil on Camazotz. And we probably will never get to tesser. I read more nonfiction now than I used to, and I’ve wondered whether that comes from a diminished willingness to enter that childlike reading state and then have to emerge from it, yet again. My impulse, in closing, is to return to L’Engle’s statement: “When you put something into words, it leads to so many other thoughts." And I think that’s true, but what thoughts, and where? I’d like to think of a way to tie this up nicely. But I don’t really think it works that way. We flow in, we flow out, the tide filling up the pool and then receding, and we are both the tide and the pool. When I wasn’t reading amongst tree branches on the roof of the neighbors’ garage, I had a favorite chair to read in, a wing chair whose “wings” sheltered me as I immersed myself in each new book, oblivious even to someone in the same room speaking to me. Eventually I’d notice the room getting dark, smell something in the kitchen, pull myself out of the book. After reading that way, I was always hungry.